Todd Haynes is not a filmmaker marred by fear, neither of his subject mater, nor his execution of it. As an openly gay director, I do feel this story is far more justified in his hands than that of a straight director, for obvious reasons. 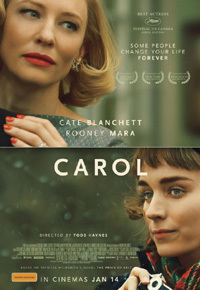 Carol finds herself living a lie as a married mother in 1950s New York. She meets therese, a younger shop attendant and aspiring photographer. Slowly they fall for each other, but the moral climate of the time has their passion for one another suppressed. With a fluid, understated flow bringing life to the 1950s (in both its atmosphere and look), what you get is a beautiful love story that feels real and authentic, but certainly not without its heartache.